I’ve been wanting to blog about Bare Minerals for quite some time. Why? Because I absolutely love it. It took me a while to try it… but I’m glad I did. You see, I was stuck with one particular type of makeup for quite some time. It was bad for my skin, but I didn’t know any better. In case you didn’t know, I’m a bit of a tomboy. I was raised with 6 guys so makeup was the last thing I’d ever ask them about. And my mom has beautiful skin (and didn’t need makeup) so she wasn’t sure what to suggest. So we went to the local Sav-Ons Pharmacy and that was when I started experimenting with makeup. I wasn’t sure what I was looking for when it came to makeup. All I knew was that I wanted my face to look flawless! And eventually I found it… in liquid foundation. I used a Cover Girl liquid foundation. I liked it because it was easy to put on and it covered EVERYTHING! It was just what I wanted and became my makeup of choice for many many years. But it was also during these years that I began to see the cons of the makeup I was using. Heaven forbid you cry, sweat or get wet- the makeup ran. And if your makeup wasn’t the exact same color as your skin it became even more obvious. If you cried, your tear would leave a light trail right on your cheek! You have the same issue if you don’t apply your makeup down to your neck; you’ll see a line where your makeup ends and your neck begins. It was like wearing a mask. A mask that could rub off on anything easily! Even worse, it makes your skin look bad. It was like my skin couldn’t breathe. I got to the point where it started making my skin look so bad (DEAD) that I depended on slathering on this makeup daily – I couldn’t leave home without it. Why didn’t I just get new makeup you ask? I did, I tried, but never liked what I bought. Some products made my face look dry, and for others it was just a hassle trying to find the right color. I wasted so much money just to use a product once or twice. In the end, I always ended up going back to my liquid foundations. At times I would ask if anybody had some makeup to recommend. I remember someone mentioning Bare Minerals so I looked it up and was curious to try it but didn’t. The thought of ordering makeup on the internet was just weird to me so I forgot all about it until about 1-2 years later when a few more people brought it up. I decided to order the Get Started kit. You want to know what my first impression of Bare Minerals was? I didn’t like it! The instructions they gave on applying the makeup were easy to follow so that wasn’t the problem, it was the end result I wasn’t happy with. Looking back I know it was because I was so used to wearing my “mask” that I felt like Bare Minerals wasn’t covering everything up the way I was used to. It took me about a week to try it again and when I got the hang of it I was hooked! Bare Minerals is perfect because you can easily adjust the amount of coverage you need. It’s also easy to choose the right colors and when you see your skin after putting on Bare Minerals guess what? It’s YOUR skin you’re seeing. It’s not a mask that totally covers your face. Instead, it enhances your skin. Supposedly it’s good for your skin; I’m not so sure about all of that honestly lol! I haven’t done THAT much research into Bare Minerals but I’ll tell you one thing – it does make your skin look good! What I love is that I don’t have to depend on makeup anymore. My skin improved so much that honestly, I only use Bare Minerals no more than once a day and really feel comfortable even without makeup. I cannot stress how convenient it is to just be able to wake up and go somewhere without having to put on makeup! Ok enough about me, lets talk about what I like (and don’t like 😮 ) about Bare Minerals, shall we? These are the only 3 brushes that I am using and quite frankly are the only brushes I think I need! Let me explain each one briefly and let you know how I use it. 1. Handy Buki Brush – Provides medium coverage. 2. 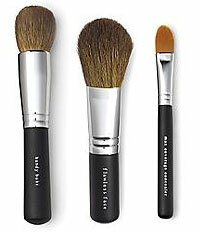 Flawless Face Brush – Provides light to medium coverage. 3. Max Concealer Brush – Provides full, more concentrated coverage. So it is recommended that if you want to use the concealer, you should use it first or last. I personally use it first. You use the Max Concealer brush (the thinnest one on the right) just like you would a concealer. Use it for minor imperfections/cover ups, dark under eye circles, blemishes, you name it. What makes it SO convenient is that you don’t have to buy a separate concealer. You use the same Bare Minerals foundation that you use as your regular makeup! The trick is that this Max Concealer brush has its bristles packed tightly so when you use it on your skin the makeup applied is more concentrated and covers up whatever you want to cover up! It’s great. So I get my Max Concealer brush with Bare Minerals foundation and dab a little here and a little there. Now the next thing I do is an extra step that isn’t necessary for everybody. But I have combination skin (an oily t-zone), so what I do next is get the Flawless Face brush and apply some of of the Bare Minerals Mineral Veil. Now the Mineral Veil does many things, but the reason I use it before applying makeup is because it absorbs oil. It’s very light weight so trust me when I say that when you use these products, you won’t feel like you have layers and layers of makeup on- I swear! The next thing I do is apply the Bare Minerals SPF15 Foundation. Now how you apply it is up to you. If you just want light coverage, use the Flawless Face brush. If you want more coverage, you can use both the Flawless Face brush first and then the Handy Buki brush next. I personally skip the Flawless Face brush and head straight for the Buki brush. By now your skin is already looking nice and pretty 🙂 … but you can do more (if you want). I get the Flawless Face brush and apply Warmth All-Over Face Color. You know how your skin looks after a good workout? A little rosey and fresh. Well this is what Warmth does. Instead of just being one color, Warmth gives you a more natural, fresh look. It gives you a natural color! I can’t really explain it in any other way. When I’m in a rush I skip this step, but I use it most of the time because I simply love the results. And finally, I finish up using the Flawless Face brush once again and apply the Mineral Veil. It’s the perfect finishing touch after applying your makeup. It minimizes pores and fine lines, prolongs the wear of the Bare Minerals foundation and just gives your skin this healthy soft look. It’s weird lol. Then you’re done! That’s all I do. Later on in the day if I feel like I’m getting a little shiney or oily, I get apply a little more Mineral Veil and that’s it, I don’t need to reapply the foundation. It’s very cool. I personally don’t use eyeshadow, so I can’t comment on the eye products that Bare Minerals sell. Sorry about that! Wow, I was going to talk about some of bareMinerals other products but I think this post is long enough already. I will do it another day and include my pictures of my bareMinerals products and let you all know what I think you should and shouldnt buy! Because yes, there is something that I bought from bareMinerals that I kind of regret. But I think I’ve said enough for today. I hope this helps some of you that are either using bareMinerals already or are thinking of buying it. I’ve recommended it to friends and they are 100% satisfied. One of my friends is already buying more products from Bare Minerals that I haven’t even tried yet! So once again, I highly recommend it. And that’s all, hope you all have a great weekend! Have you heard of a new all-natural mineral makeup line created by a Latina women for Latina women? You need to check it out. The company is called Mia Mariu and was launched in December of 07.